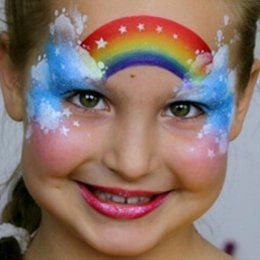 Every face painting course you take here is special. It's designed to help you build skills to last a lifetime. Set a solid theoretical fundament and become confident of gained knowledge. 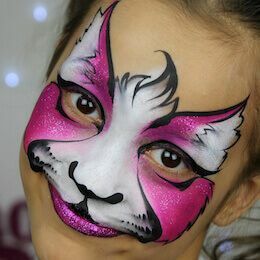 Sharpen your skills and improve your knowledge of the industry by mastering face painting techniques. Nail 45 carefully selected designs, that will help you master perfect placement and will teach you how to create your own beautiful balanced designs. Solidify your knowledge and gained skills by performing practical tasks and quiz-tests. Get valuable feedback from the tutor that will help you understand your mistakes and how to fix them for a fast improvement. Connect with your classmates, discuss learned material, address more questions and get answers and simply have fun! 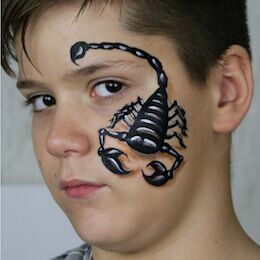 Get a unique Diploma of graduation with a special Badge, that will confirm your new status of a Certified Face Painter. 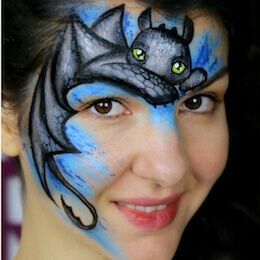 Boost your face painting career and become a professional in the industry. Part 1: Business basics — Professional tools of the trade and best hygiene & safety practices. 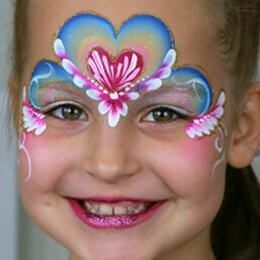 Learn what products and tools a face painter needs, where to find them, and what to qualities to seek in your tools and products for best results. 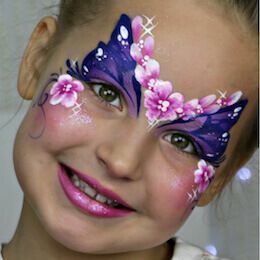 Find out how to build a face painting kit to meet your needs. Understand all you need to know about hygiene, occupational health and safety, and how to take care of your materials. 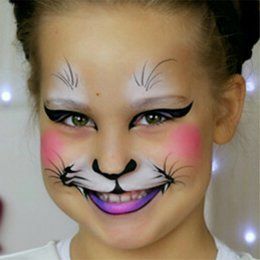 Find out the differences between types of face and body paints, ie wax based v glycerin based, neon paints, pressed powders etc. Explore color theory and how to achieve color balance in your designs. Master how to make your own split-cakes and custom gem-clusters. 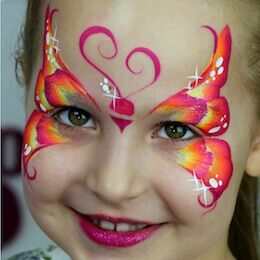 Face painting basics: safety, professional materials, recommendations and practical advice. Practice tools and methods. Comparative review. 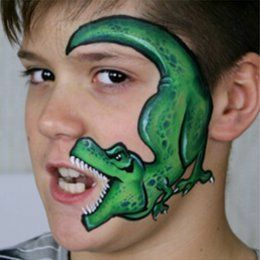 About Face Paints. Review, comparison and recommendations. 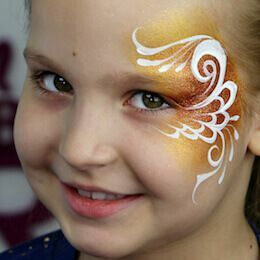 Gold and silver paints. 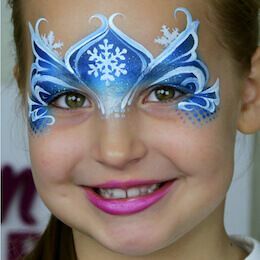 Powders for face painting. Neon paints, terminology and safety. 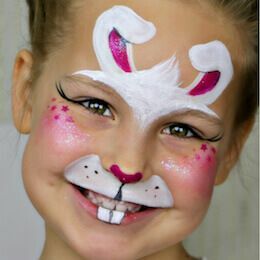 Brushes, sponges, stencils, glitter and all the other little things a face painter needs. Hygiene and taking care of materials. How to fix split brushes tips and damaged paints. Color-wheel theory. Making your own split-cake. Part 2: Perfecting your painting fundamentals, building a professional kit & professional tips for use on the job. Master working with different paint consistency. Develop skills in linework and double dip techniques. 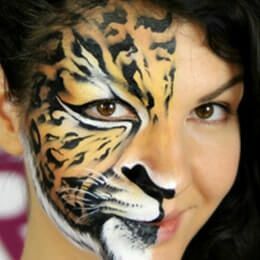 Discover how to use filbert brushes and became a blending master. 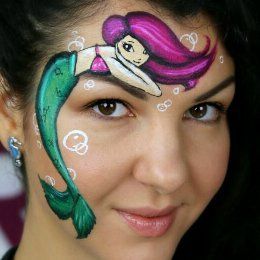 Find out how to work with sponges for great results. Nail one stroke techniques and know how to paint beautiful one stroke roses. 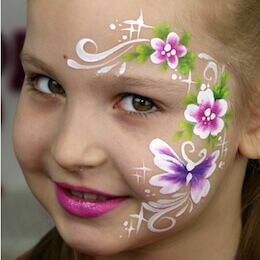 Find out how to use glitter and stencils in face painting. 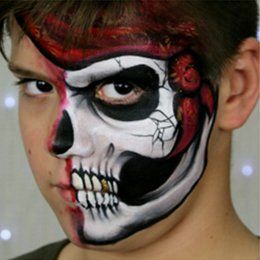 Discover how to build a perfect face painting setup. Working with paints. Paint activation and loading, paint consistency for different types of work. Round brush work technique. 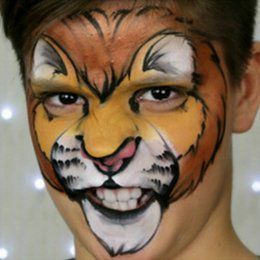 Main types of linework in face and body painting. The Double dip technique. Double dip flowers, clusters, reversed teardrops, triple dip technique. One stroke technique. Working with split-cakes. Working with filbert and blending brushes. Working with sponges. Kabuki brush. Building your own setup. Outdoor gigs. Most comfortable body postures for painting. 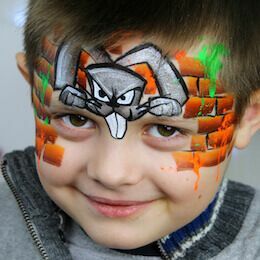 Displaying face painting designs for different gigs. Part 3: Implementing what you've learned. 45 design assignments that will perfect your use of the fundamentals, focal point theory and design balance as well as development of your own painting style. 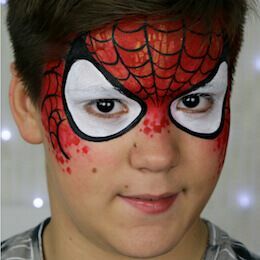 Master the focal point theory and will learn how to use it in face painting. Find out easy steps to achieve symmetry in your designs. 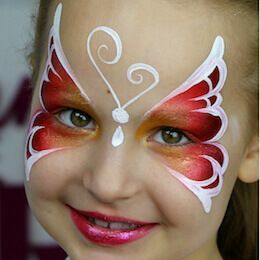 Learn how to create butterflies of a perfect balanced shape. 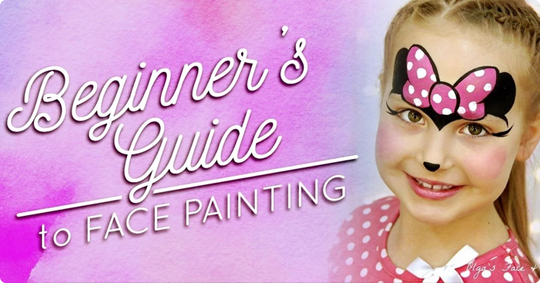 Discover the secrets of painting most delicate fairies and princesses. 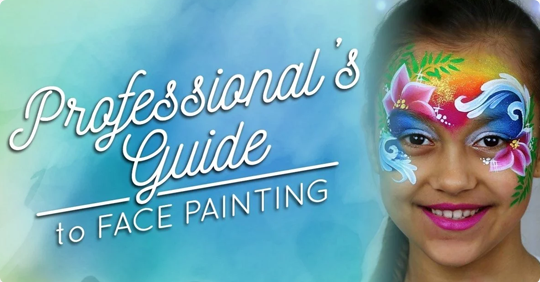 Master your skills on painting beautiful ponies and horses. 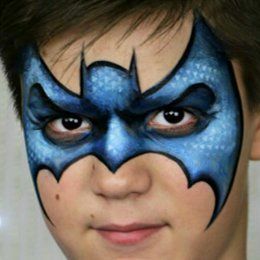 Find out effective ways of creating animal masks and superhero designs. 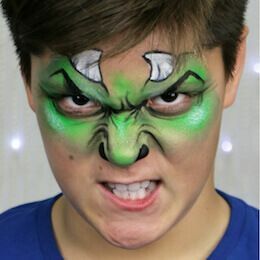 Learn how to create scary designs. Discover the secrets of creating realistic 3D designs and will learn how to work with light and shadow. Find out how to create your own unique designs. 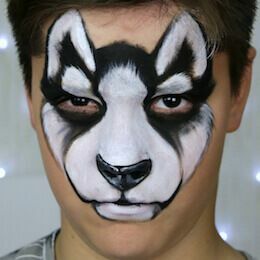 Basics of working on face. Focal points. Symmetry in designs. 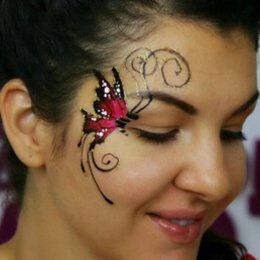 Everything about butterflies. Geometry, types of butterflies and painting techniques. Kitty cats, Bunnies and Puppies. 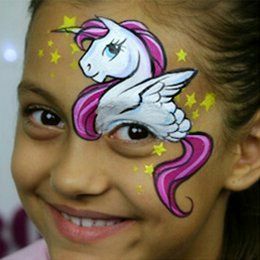 Horses, Ponies, Unicorns and Pegasi. 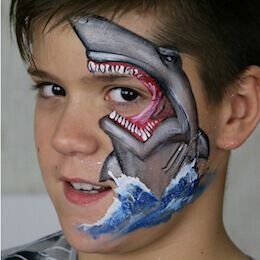 Light and shadow in face painting, creating realistic 3D objects. Steps for creating your own design. BONUS Module: On-the-Job and Business essentials.